Halloween is this week. Is it just me or has Halloween slowly turned from one night into a whole month-long extravaganza of trick-or-treating? I used to buy into this extravaganza. For a few years, we did trick-or-treat at the mall, then a trunk-or-treat, then a special event somewhere else and FINALLY came actual Halloween night. I swear the kids filled up bucket upon bucket upon bucket with candy during the month and by the end of it all I was more exhausted than ever. Like I said, I don’t buy into all that anymore. We do one night of trick-or-treating and we’re done. 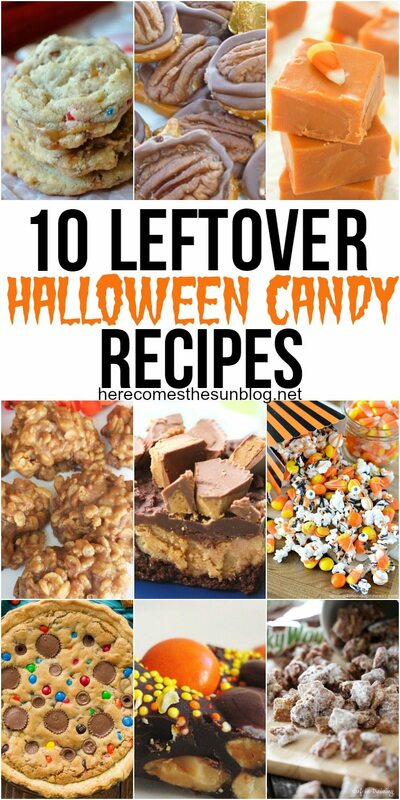 But before you go calling me the Halloween grinch, I’m going to share 10 Leftover Halloween Candy Recipes with you.